A moisturizer has to be many things for me to give it a seal of approval. It must smell nice. It must not be greasy. It must sink into the skin immediately. But above all, it has to turn my dry, ashy, flaky, scaly skin into a thing of beauty. 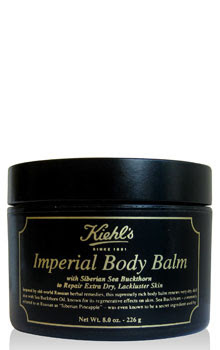 Kiehl's Imperial Body Balm does all this and more -- making it one of my all-time favorite moisturizers. To start with, I adore the packaging. The black tub is so chic, I've been displaying it on my vanity for days. It has an almost old-world apothecary feel -- not surprising as it was inspired by old-world Russian remedies. I also love the vibrant yellow hue of the balm. It looks like whipped butter! And rather than feeling like a traditional balm -- waxy and greasy -- it's thick, rich and super lush. But the true test of my adoration? Whether it would rid my legs of the ashy dryness they'd been exhibiting. Imagine my shock and delight when after only one use, they were gleaming. GLEAMING. I haven't seen them this radiant in weeks. This is due to ingredients like sea buckthorn berry oil (which has Vitamins A & E, carotenoids and palmitoleic acid to protect skin from free radicals), cocoa butter (to lubricate the skin), and honey (to rehydrate, moisturize and soften skin). All in all? My skin has never looked healthier, shinier or smoother. I feel like a queen.